Do you ever wish you could shift your home’s floorplan around to make your house work better for your family? For our clients in Richmond Hill, we did exactly that. Their existing 1960s bungalow with one bathroom featured a rather typical layout with a small kitchen and living space in the front of the home and three bedrooms in the back. Over the years, a sliding door was added in place of a bedroom window, providing access to the backyard; however, the solution wasn’t ideal, especially when entertaining or dining alfresco. The couple desired a home that would offer more living space and a better connection to the outdoors. They also wanted to add a second bathroom and a larger kitchen, while updating the finishes throughout. Rather than shoehorn their vision into their current layout, our solution took a new twist (quite literally) – we flipped the floorplan. By moving the bedrooms and private spaces of the home to the front of the house, it allowed us to expand upon the rear with an addition, offering more living space better-suited to our clients’ needs. 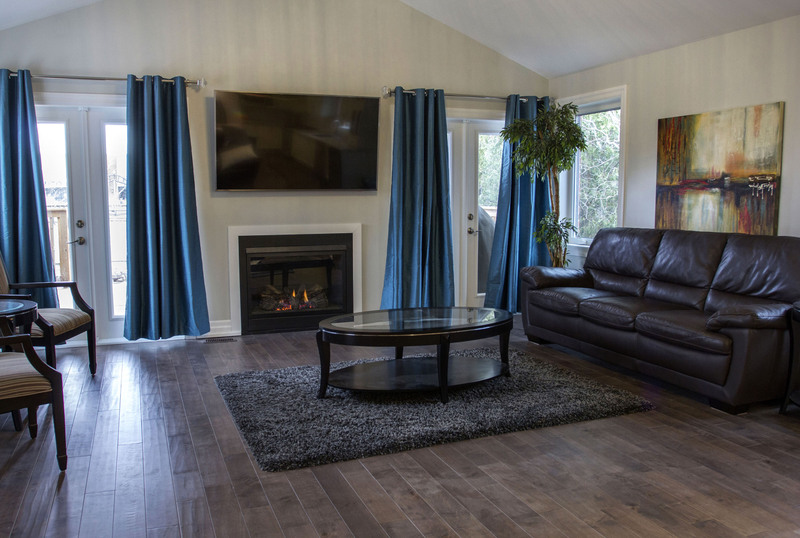 Structurally speaking, we designed the new family room addition with a dramatic cathedral ceiling, which opens up the bungalow and provides a more defined living space. Flanking either side of the gas fireplace are two sets of French doors that flood the room with natural light and allow easy access to a large covered wooden deck, which also extends the living space outside. 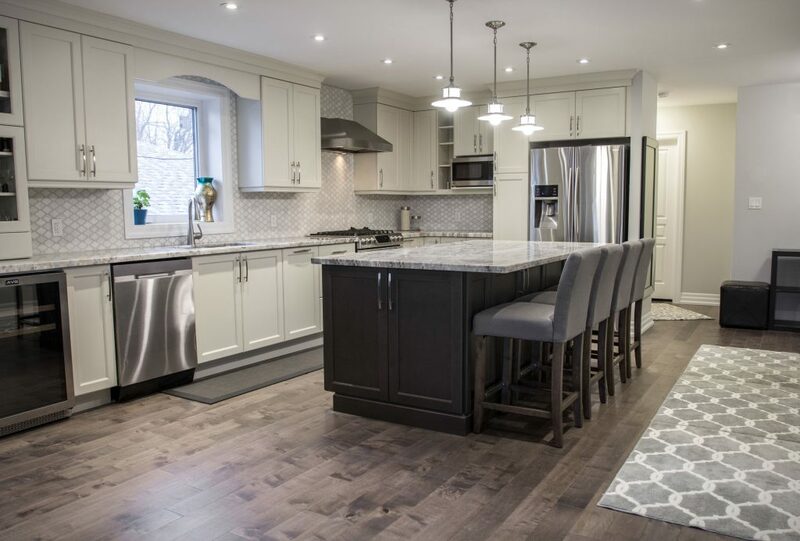 At the heart of the home is a new open concept kitchen, anchored by a large island with seating in the centre. Crisp white cabinetry, a marble backsplash and grey granite countertops offer a timeless aesthetic, but they also complement the darker contrasting woodwork of the custom island. These design elements continue on into the main bathrooms, which feature marble-tiled showers with glass doors. The white cabinetry and grey-toned countertops also ensure a cohesive flow between the spaces. Of course, what addition would be complete without a mudroom and main floor laundry room? This is a must-have for many of our clients looking to enhance the function of their homes – and it’s a smart use of square footage. Now the family has a dedicated area at the rear of the house to unload their belongings and keep clutter from spilling into their new renovation. 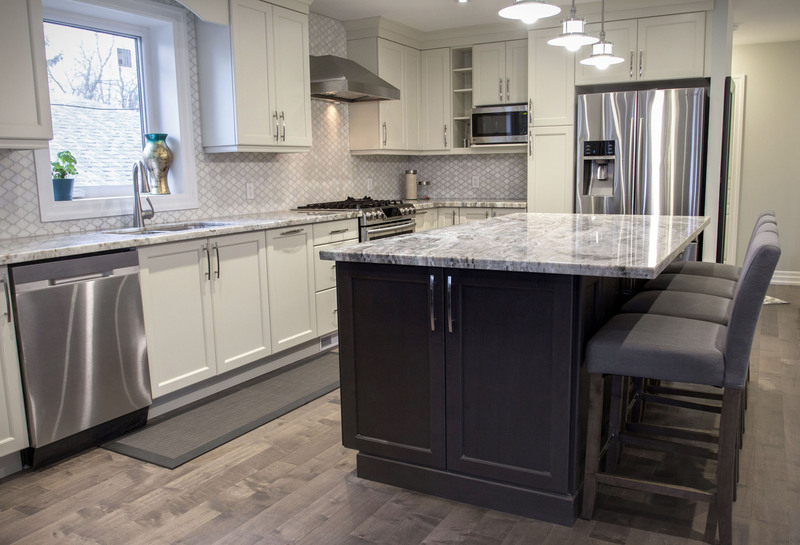 It was such a delight for our team to work on this project; we’d love to have the same opportunity to transform a dated floorplan in your home into one that’s truly dynamic. 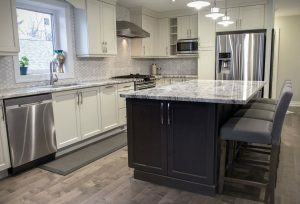 To see more before and after photos of this Richmond Hill addition and renovation, click here to visit our Project Gallery.